Sounds like there's been some big get togethers going on aboard the Fosen! I look forward to seeing some photographs of these meetings. I arrived back in Edinburgh last night, and have so much to catch up with, even though I was able to manage a few posts while I was away. Actually that has probably confused me as to which threads I’ve seen and which I haven’t, so please forgive me if I seem to have ignored responding to things you thought would have interested me! Well ostafjells, I can be really shy and “wooden seagull” sometimes, but not among our CV family members. 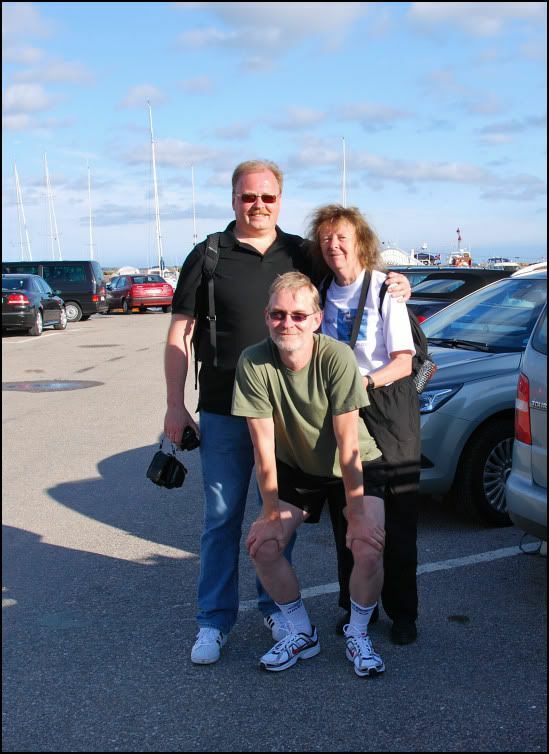 Steve has already been requesting photos, so to keep you all happy while I get around to pictures of Trondheim, a day aboard Midnatsol, QM2 in Ålesund, and Tall ships in Kristiansand (plus my 365 “skyscapes” of course), here are the two photos from the CV Family Album you’ve all been waiting for! 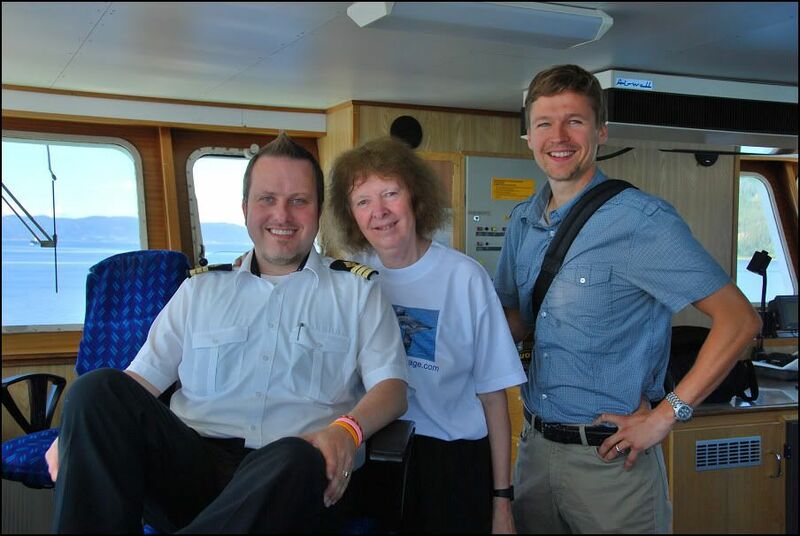 PS – note Seagull’s CaptainsVoyage T-shirt! Oh, how happy these make my heart!!!!! So many dear friends!!! So much FAMILY!!!!!!! You all look great!!!!! BIG THANK YOU, Lady C--and EVERYONE!!!!! I can assure you, E...., this is a gathering you would've liked to be a part of. No tour operator could ever arrange a boat trip like 'HurtigruteMartin'...!! And Cecilia: remember to process your pictures of the cannon battle between "Shtandart" and "Sørlandet"
Thank you for these pictures. You are right. That was the most important thing to do! I hope we manage to meet altogether some day. I have a thing with pictures, I don't get any peace of mind for next event before the "old" event is completed and categorized…. So peace of mind is totally out of the question, for I leave for Heathrow tomorrow, and on to Singapore! But I know that the moment I get back at the end of the month I’ll be instantly and totally absorbed in what you’ve all been up to. Is there a CV members gallery at all, other than the 'self portrait' thread? If not, would one work? I guess a CV members gallery would work, but would everyone agree to put his/her image up on the web to stay there for ever....? But a thread like this will be worthless if only a handful active (the most active) members will post. Enjoy your voyage to Singapore!!!!!! Take many pictures, and take care!!! Cecillia have a GOEDE REIS and enjoy you're visit there. WAOW... have anice trip, safe flights and bring back lots of photographic memories! Yes, for the Formula 1 Race. (Just about to send him off on his own journey in the post). Car races in Singapore: oh, goodie... a bit away from the slow pace of my ferry. HAVE SO MUCH FUN, Lady C!!!! I'll look for you on TV! Paul, did you know that if you view the public profile of a member you will see (only if you are logged in as a member) their profile picture if they have one? Me or ehp for example – but I see Sterkoder hasn’t made one yet! But perhaps you were referring to when members have met ? When I’ve met up with members who are OK about photos being posted, it always seems to have been in the context of other photos or threads, so the idea of a gallery or special thread for that kind of thing hadn’t occurred to me. Only just spied this and I hope I'm not too late. Cecilia - have a really good time (I know you will!) and bring back more of your wonderful photos (I know you will !!!! ).